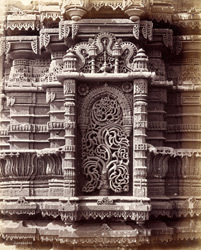 Photograph of a niche of the minaret of Muhafiz Khan's Mosque at Ahmadabad in Gujarat, taken by Henry Cousens in the 1880s, from the Archaeological Survey of India. This small mosque was built in 1465 by Jamail-ud-Din Muhafiz Khan, who was a nobleman at the court of Sultan Mahmud Begarha (r.1458-1511) and appointed chief magistrate of Ahmadabad in 1471. The facade has three arched entrances and minarets with floral carving at either end. Theisarrangement of the minarets at the extreme ends of the building, similar to the Isanpur mosque, was a new architectural style in Ahmadabad in the 15th century. This view shows a carved niche, with a delicate floral design, on one of the minarets. James Burgess described the building in Archaeological Survey of Western India, Vol VII, "The minarets...are among the most richly carved at Ahmadabad, and the panels of rich floral tracery that adorn the three sides of each have been the subject of the greatest ingenuity and care. The floral work, though wrought on the stone, is all undercut to such an extent that it is almost entirely detached from the supporting slab behind, and at almost any point the finger can be passed behind the carved tendrils, which are only connected to the slab at certain points."